Here is an eye-opening article on a most misunderstood subject. Some ask, "Wasn't tithing just for the Jews?" Others, "Wasn't tithing done away?" Or, "Was it a form of national taxation in ancient Israel?" Or, "Was it to supply material needs to the poor?" Here is the New Testament teaching. You'll find this article interesting, enlightening, plain! Or did God perhaps leave it for each one to give what he feels like—if he feels like giving it? Others ask, "Wasn't tithing just for the Jews?" Or, "Wasn't tithing done away? Wasn't it just part of the ceremonial system introduced by the old covenant law of Moses?" Man was placed on earth for a purpose. And always, from the very beginning, God has had on earth a priesthood—a ministry representing him, making known his will to man, carrying out God's mission. It does cost money to carry on Christ's ministry. And today with super-powered facilities of radio, television and printing press, of rapid transportation to every part of the world—facilities making it possible to reach vast masses over great distances in short time—the carrying forth of God's last warning message to a deceived world is a herculean task of gigantic proportions requiring large sums of money. The word tithe means "tenth." A tithe of anything is the tenth part of it. It is well recognized that the people of Israel, during Old Testament times, were required to pay tithes. That is, one tenth of income—whether livestock, grain or money. But the New Testament teaching on tithing is not generally understood. Yet the subject is mentioned many places in the New Testament. Since it is a priesthood subject—the financing of Christ's ministry—it's well to look first at the priesthood book—Hebrews. The book of Hebrews reveals the Christ of the twentieth century—the work and office of our Christ today—Christ the High Priest of God! And it contains God's instruction for financing the ministry of Christ! The seventh chapter is the tithing chapter. Speaking of the Christian hope of eternal life (which hope is Jesus Christ), we are told, beginning verse 19, chapter 6, this hope (Christ) has entered "within the veil"—that is, the very throne of God in heaven—"whither the forerunner is for us entered, even Jesus, made an high priest for ever after the order of Melchisedec" (verse 20). And as High Priest he holds a definite rank—a rank that outranks every priestly office—"after the order of Melchisedec," or, in the plainer English of the Moffatt translation, "with the rank of Melchisedec." First read the first five verses, Hebrews, chapter 7: "For this Melchisedec, king of Salem, priest of the most high God, who met Abraham returning from the slaughter of the kings, and blessed him; to whom also Abraham gave a tenth part of all …abideth a priest continually. Now consider how great this man was, unto whom even Abraham gave the tenth of the spoils. And verily they that are of the sons of Levi, who receive the office of the priesthood, have a commandment to take tithes of the people according to the law…." Let's understand it. This vital passage of Scripture begins to compare the two priesthoods. Notice, back in patriarchal times, tithing was God's system for financing his ministry. Melchisedec was High Priest. The patriarch Abraham, it is written, knew and kept God's commandments, his statutes and laws (Genesis 26:5). And he paid tithes to the High Priest! Melchisedec, "having neither beginning of days, nor end of life…abideth a priest continually" (Hebrews 7:3). Yes, he was High Priest from the beginning! Even from Adam! And the ancient patriarchs from Adam down through Abraham, Jacob and on to Moses, financed this ministry of God on earth by the TITHING system! Now continuing, the teaching concerns which of the two priesthoods—Melchisedec or Levitical—is superior, to determine which priesthood should receive tithes, now! Christians of Paul's day did not need to be instructed that tithing is an obligatory and permanent law of God. But they did need much teaching to make clear to them that the old covenant was vanishing away—the Levitical priesthood changed and replaced by that of Jesus Christ—the Melchisedec priesthood restored! The only question was as to which priesthood tithes were to be paid. Notice the scripture: "Now consider how great this man was, unto whom even the patriarch Abraham gave the tenth of the spoils…but he whose descent is not counted from them [the Levites] received tithes of Abraham, and blessed him [Abraham] that had the promises. And without all contradiction the less [Abraham] is blessed of the better [Melchisedec]…. And as I may so say, Levi also, who receiveth tithes, payed tithes in Abraham. For he was yet in the loins of his father, when Melchisedec met him" (verses 4, 6-7, 9-10). "For the priesthood being changed, there is made of necessity a change also of the law" (verse 12). It does not say the law was abolished. The change in priesthoods makes necessary a change in the law. What specific law? The very law this chapter is instructing New Testament Christians about—the TITHING LAW! "…the sons of Levi…have a commandment to take TITHES…according to the law…" (verse 5). Here again comes a truth man would never know, and could not find out, except by God's revelation to man! What is man, anyway? Why is he? Where is he going? God has a plan! God is working out a great purpose! He reveals it in his Word—his revelation—the Bible. For the carrying out of his holy purpose in placing mankind upon this earth, God has always had a priesthood—a ministry, representing him, serving him, carrying out his mission. Way back in the dim antiquity of patriarchal times, God's High Priest—his representative on earth—was Melchisedec. During the national dispensation of Israel, under the old covenant, known as the Mosaic dispensation—those years from Moses until Christ—the tribe of Levi constituted the ministry of God, known as the Levitical priesthood. Then later, when Jesus Christ arose from the dead, he ascended to heaven as a living High Priest. Today he calls ministers as his true representatives in a darkened and Satan-deceived world, to carry on his plan. Today the Melchisedec priesthood is restored, in Christ. And when you pay such a bill to a collector, you consider you paid the company—not that you made a personal donation of your own money to the man the company sent. You paid it as to the company. From there on it is the company's responsibility what happens to that money, not yours. And the company pays the collector his salary. He does not consider that you paid his salary—he receives his salary from the company. Here again so many in this modern world have lost sight of God's clear directions. When they give the tithe to a minister they seem to feel it is a special entrusting of their own money, and they make it their duty to try to supervise how the minister handles it—even, in some cases today, down to the supervision of what the minister and his family may eat or wear or have in their personal private family life! When you have done that, your responsibility for that money ceases! You have no further concern, responsibility, or direction in the handling of it than you have in money you owe the electric power or the telephone companies that you pay to their collector. Once paid, you have done your part—you have acquitted yourself of your obligation. Of course you are expected to be sure the collector is the company's approved representative—not a thieving imposter pretending to be the company collector. And you should be equally sure you are paying your tithe to a called and true minister of Jesus Christ. Satan has many more ministers today than Christ—and Satan's thieving imposters pose as ministers of Jesus Christ, put on sanctimonious airs, speak in pious and spiritual-sounding language! How are you to know? By their fruits, Jesus said, you shall know them! The fruits of God's Spirit and of Christ's true ministry cannot be counterfeited! Now the nature of God's ministry on earth has changed with changing dispensations. Not much is revealed as to how God's ministry was carried on back in patriarchal times. We know Melchisedec was High Priest—that he held rank equal to that of Jesus Christ, actually one of the Godhead! The ministry, then, must have been of a spiritual nature. New Testament writings reveal that the gospel, God's spiritual message, was preached beforehand to Abraham. All we know of those days of the dim distant antiquity is that the tithes were paid to Melchisedec, a divine Being, for the service of God's ministry for that time. But beginning with Moses, a new and different dispensation was ushered in. God formed Israel as a civil nation, and also as a church. (See Acts 7:38.) But between Moses and Christ under the old covenant, God's ministry was purely national, for Israel alone—and purely material, not spiritual. Today, we are in the age of grace, the New Testament gospel dispensation. Today the Levitical priesthood is gone, and Jesus Christ is High Priest. Today all true ministers of Jesus Christ are called by special spiritual call from God through his Holy Spirit—not by flesh birth—not by self-desire to become a minister—not by selection, appointment or vote of the people. Jesus Christ came as God's messenger, bearing a spiritual message from God to man. That message of his gospel—the good news of the coming kingdom of God, a kingdom of immortals that human flesh and blood can never enter! One must be born again! And today, Christ's commission to all his true ministers is "Go ye into all the world, and preach the gospel." "Go ye, therefore, and teach all nations." And, for our day now: "…This gospel of the kingdom shall be preached in all the world for a witness unto all nations; and then shall the end [of the age] come" (Matthew 24:14). They cannot be subsidized, controlled, coerced by men or organizations of men. They are not hired by, nor obligated to, men or any organized group or denomination. They are called by God, guided, protected and empowered by God, financed by GOD'S own tithing system!—yes, by GOD'S OWN MONEY! 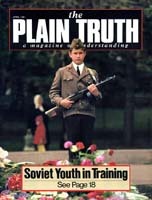 That is how The Plain Truth is published—without subscription price, free to all who request it.